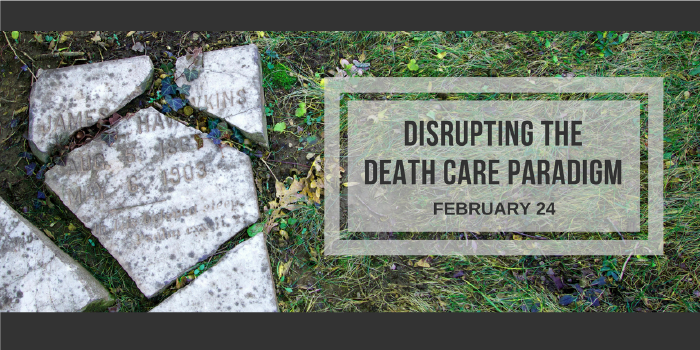 The Wake Forest Journal of Law and Policy will present the symposium, “Disrupting the Death Care Paradigm: Challenges to the Regulation of the Funeral Industry and the American Way of Death,” on Thursday, Feb. 23, and Friday, Feb. 24, in the Worrell Professional Center, Room 1312. The event is free and open to the public. Up to four hours of free Continuing Legal Education (CLE) credit is available from the North Carolina Bar for both the live in-person event and live webcast, according to organizers. The event will be live webcast. Registration is available (but not required). “We encourage those watching the live webcast to submit questions for any of our presenters on Twitter @WFULawJLP or e-mail JLP at wfulawpolicyjournal@gmail.com,” says Symposium Editor Erica Oates. Caitlin Doughty, a funeral director, well-known voice in the Death Positivist movement, and the author of a New York Times best-selling book on this topic, will give a keynote address at 6 p.m., Thursday, Feb. 23, in the Worrell Professional Center, Room 1312.